Epidemiological criminology is an emerging paradigm which explores the public health outcomes associated with engagement in crime and criminal justice. This book engages with this new theory and practice-based discipline drawing on knowledge from criminology, criminal justice, public health, epidemiology, public policy, and law to illustrate how the merging of epidemiology into the field of criminology allows for the work of both disciplines to be more interdisciplinary, evidence-based, enriched and expansive. This book brings together an innovative group of exemplary researchers and practitioners to discuss applications and provide examples of epidemiological criminology. It is divided into three sections; the first explores the integration of epidemiology and criminology through theory and methods, the second section focuses on special populations in epidemiological criminology research and the role of race, ethnicity, age, gender and space as it plays out in health outcomes among offenders and victims of crime, and the final section explores the role policy and practice plays in worsening and improving the health outcomes among those engaged in the criminal justice system. 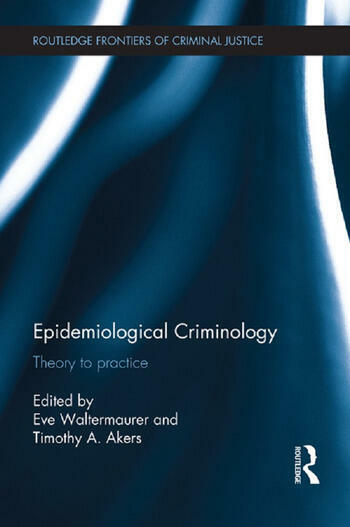 Epidemiological Criminology is the first text to bring together, in one source, the existing interdisciplinary work of academics and professionals that merge the fields of criminology and criminal justice to public health and epidemiology. It will be of interest to academics and students in the fields of criminology, epidemiology, and public health, as well as clinical psychologists, law and government policy analysts and those working within the criminal justice system. Eve Waltermaurer is currently the Director of Criminology at the State University of New York (SUNY) New Paltz. In addition, she is the Director of Research and Evaluation for SUNY New Paltz’ Center for Research, Regional Engagement and Outreach (CRREO). Prior to her current position at SUNY New Paltz, Dr. Waltermaurer worked as a Public Health Epidemiologist at the Violence Prevention Unit of the New York City Department of Health. Timothy A. Akers is a Professor of Public Health and Associate Dean for Graduate Studies and Research in the School of Computer, Mathematical and Natural Sciences at Morgan State University (MSU) in Baltimore, Maryland. Professionally, Dr. Akers' career has spanned both public health and criminal justice, where he was a former Senior Behavioral Scientist with the U.S. Centers for Disease Control and Prevention (CDC) and has worked in law enforcement, community-based corrections, the prison system, and as a planning and research analyst for a municipal police agency.